A widget is the best way to add your accordion menu to any widgetized area within your theme. Most commonly themes widgetize their sidebars, but the theme’s footer, and sometimes even the home page layout, may also be widgetized. There are two widget types – one for the standard menu (those that you create manually in Appearance > Menus) and those that are auto-generated based on a term or post hierarchy (available to Pro users only). This widget allows you to insert a menu that you’ve created in Appearance > Menus, with a particular Configuration. 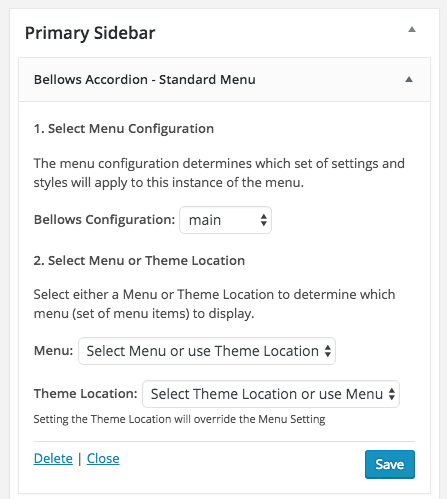 With Bellows, you will almost always be using a Menu rather than Theme Location, but the Theme Location option is offered for flexibility. Pro users will also see the Bellows Accordion – Autopopulated Menu widget available. This widget allows you to add an accordion menu based on any saved Autopopulation Query you’ve created in the Menu Generator UI. The Configuration and auto-generated menu contents will be set in the Menu Generator UI rather than the widget settings.